The Arkansas College Media Association announced John Brown University Senior Jenny Redfern as the 2013 Editor of the Year at Friday’s annual gathering. Threefold Advocate photo editor, JP Garcia, won Photographer of the Year, and the newspaper overall ranked #1 in In-depth News and #2 in Editorial Writing among other Arkansas colleges and universities. 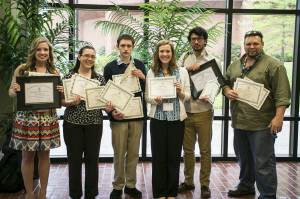 The Threefold Advocate’s staff also brought home awards in specific areas. Pictured left to right:Jenny Redfern, Esther Carey, Jon Skinner, Laura Roller, JP Garcia and Ron Asbill.